So apparently it’s State Pride week at Our Best Bites. We totally plan these things from time to time. Go, Idaho! Go, Louisiana! Just kidding. It’s just a funny coincidence. And Mardi Gras. I am not kidding when I tell you that my kids are just about as excited for Mardi Gras as they are for Christmas. Parades, candy, music, screaming like idiots for beads and plastic cups. If I’m being completely honest with myself, it’s a pretty awesome holiday–it involves lots of yummy food, fun, great music, and very little effort or preparation on my part. One of my favorite Louisiana foods is Dirty Rice. Now…this recipe comes with a big disclaimer. Dirty Rice is traditionally made with chicken livers and gizzards. I don’t care how good they make your food taste, I cannot cook with them. I can’t knowingly eat them. I know fabulous cooks who most likely use them, but I don’t ask. I know all that stuff (and more) probably goes into sausage, but I don’t know know (and I don’t ask). So, in case you haven’t guessed, I’m not using tiny organ meats in my dirty rice, and no, the color isn’t quite “dirty” enough, but if it really bothers you, you could use soy sauce. But I’m pretty sure that too-light, gizzard-free dirty rice is still more “genuine” than dirty rice with soy sauce. Or you could just be brave and use the livers and gizzards, but I’m not gonna tell you how to cook ’em. If you leave me a comment or send me an email about how this is not dirty rice and I am an abomination and an embarrassment to the State of Louisiana, I will say something rude back. Don’t say I didn’t warn you. I have a cold, pregnancy hormones flowing throw my veins, and I just discovered that the “water” that’s been standing in my driveway for the past two weeks was not a) a yard drainage problem or b) a water leak, but c) my sewer line leaking onto the most high-traffic part of my property. All of these things have contributed to the temporary disappearance of the filter between my brain and my mouth. For this rice, which you can serve as a side dish or a main dish, you’ll need 1/2-3/4 pound of pork sausage (you can use mild or spicy, but I’d rather use mild and then be able to control the heat myself), chopped onions, garlic, green peppers, and celery, Cajun or Creole seasoning (like Tony Chachere’s), black pepper, Tabasco sauce (yeah, dirty rice can range anywhere from having a little bite to being spicy spicy spicy), beef broth, long-grain white rice, and kosher salt to taste. If you want, you can also garnish it with chopped green onions. In a large skillet over medium heat, begin browning the sausage. 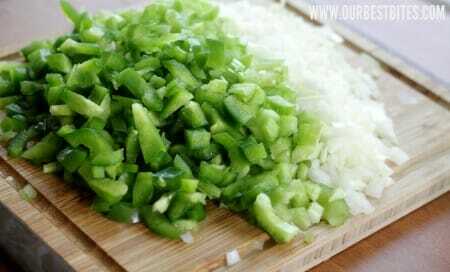 When it’s about halfway cooked, add the chopped onions, peppers, celery, and garlic. Saute until the sausage is cooked and the veggies are tender. Add the rice and cook, stirring constantly, for about 2-3 minutes. Add the black pepper, Tabasco, and Cajun seasoning and stir to combine. Add the beef broth and bring to a boil. Cover, reduce heat, and simmer for 20 minutes or until rice is tender (it could take up to 45 minutes at high elevations). Remove from heat and allow to stand covered for 5 minutes. Season with salt to taste and toss with green onions if you feel the urge. Preheat a large skillet (with sides) over medium heat. Add the sausage and cook until it is about halfway browned. Add the onion, celery, garlic, and green pepper and cook until the sausage is cooked and the vegetables are tender and fragrant. Add the rice and cook for another 2-3 minutes, stirring constantly. Add the Tabasco, Cajun seasoning, and black pepper and stir until combined. Add the beef broth and bring to a boil. Cover tightly, reduce heat, and simmer for 20 minutes or until the moisture is absorbed (again, higher elevations may take as long as 45 minutes). Season to taste with salt and Tabasco sauce. 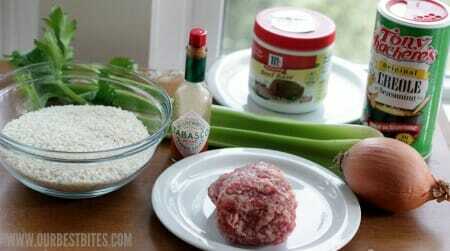 If desired, toss with green onions before serving. Makes 10-12 servings. Also, if you haven’t checked out our Wall Written giveaway, head over there and enter! Kate, you make me laugh. As for tiny organ meats, can we just say “gross” and leave it at that? oh dear Kate, I am SOOOOO kidding! I hate them too! Yuck! This looks delicious and I may have to try and make it. Gizzard and liver free of course. Looks delicious! Feel better soon!! My family lived in New Orleans for 12 years (I was away at college/mission/grad school for most of it) and my sister LOVES dirty rice but the way she described it always sounded nasty to me so I don’t think I’ve ever actually tried it but this sounds delicious. We always try to celebrate mardi gras a little bit and maybe this will make an appearance on our table this Tuesday. Thanks for the recipe! LOL away–I know I’m being silly here! 🙂 And I know I’ve had dirty rice with tiny organ meats in it and it is GOOD, but I didn’t KNOW know. And I didn’t see them or cook them, so I just feigned ignorance. I am totally with you on the whole “tiny organ meat” thing. Growing up my mom would put the turkey ones in her stuffing on Thanksgiving…I have had a problem with stuffing ever since. This grossness free version of dirty rice looks delicious, we will be eating this very soon at my house. Thanks for another great recipe! I’m totaly with you on moms’ turkey & chiken stuffing. I still can’t eat any stuffing to this day even thou it is not made with those “tiny organ meats”. Ahh! I have a sewage leak in my house too! We found it on Valentine’s Day after dinner. My kitchen is broken right now, and it’s no fun. We are probably going to have to fix all the sewage pipes in our home eventually. I’m also pregnant, so the hormones just are going crazy and I woke up really frustrated this morning. I hope you get that fixed soon, and I’m glad there’s somebody else going through something similar—even though it’s not fun and not cheap to fix! Now I’ll go back and read more about the rice! Thanks for sharing life stories, and recipe stories, I love your blog! Kate, I am so sorry about your driveway liquid issue. I just love you both that it makes me sad when regular life stuff happens to you guys too. Thanks for not cooking with organs, yuck. Even though I went to culinary school, I still pretend not to know what offal is…my motto is, offal is awful!! Hey if you want this darker there is something called “kitchen bouquet” is it just a browning sauce. I use it to trick people when my gumbo roux doesn’t darken enough (because I am scared my gumbo will taste too rouxish), but I don’t realize that the roux isn’t dark enough until it’s too late. A little goes a long way of this stuff and from what I can tell, it doesn’t add flavor or anything. Btw way I vividly remember the day I found out what was actually in dirty rice. I was in the grocery with my mom around thanksgiving and she had all these parts in her cart, I was like whoa what are those for? Still ate it though and it’s still yummy, however I’m not cooking with them! This sounds like a nice alternative to the box I used to make. This made my day. Although I never have cooked with organ meats and never will, we often follow the “don’t ask, don’t tell” rule in our home. Lately the kids are starting to get a little smarter…I do believe this will be a big hit, though! 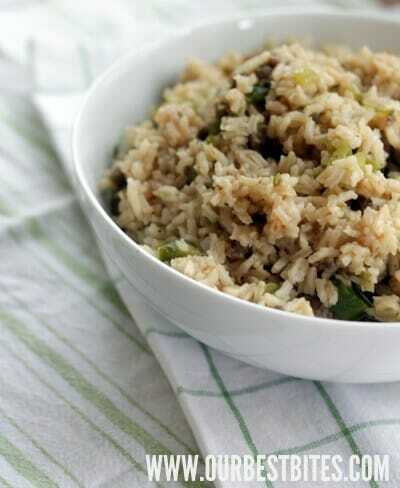 Rice dishes are always the first to go at dinner time. Thanks for sharing! Sounds great, will be trying it soon. Also did your pie in the jars-so cute. There are a lot of times I’d rather not know what was in something…because as soon as I do, I lose my appetite. I know there are sometimes anchovies in Ceasar dressing…well, yesterday I looked at the back of my dressing bottle and sure enough…they were in the ingredient list (although at the end of the list)! Maybe the dressing is always made with the anchovies but I really wish I hadn’t looked. I’m not so interested in a ceasar salad at the moment! Sorry to hear about the sewage leak. Will your homeowners policy pay to clean the carpets in your house? Maybe you can get one of those disaster companies to do it for you which would be even better! 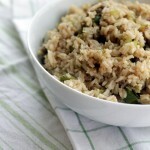 We love dirty rice, and this recipe sounds absolutely perfect. I love your pregnancy hormones. Honestly is always appealing, funny, and human. 🙂 I am not pregnant, and I do not want to cook with tiny organ parts, either. I’m feeling your pain. Isn’t home ownership OVER-RATED sometimes? This week my website got hacked (fixed now), My roof is leaking evidenced by paint sliding down the wall, I have sick kids, and…AND my TIVO died. Forever. And I didn’t get to see Modern Family. I know my life is hard. Would Funeral Potatoes be the State Pride post for the Beehive state? It would have to be, right? I’m with you on the organ meats. You know what livers do, right? They collect all the poison in your body! I’ll admit to boiling “little organs” for broth, but I don’t chop them up and put them in the finished product, and the livers get tossed. And I’m pretty obsessive about saving food – like boiling bones for broth, and saving the fat from chicken and bacon. We also live in an old house – they have lots of “character”, yes? My Southern husband will love this! Thanks for making a gizzard-free option for those of us Westerners! Kate, I live in Ponchatoula, Louisiana which,if you don’t know, is about 50 miles west of New Orleans. My family cooks dirty rice all of the time and we never put livers and gizzards in our rice. Only mushrooms and sautéed onions. I know that I’ve eaten dirty rice with lovers and gizzards, but I didn’t know those were in it. Like you I can’t bring myself to cool with any of that. Good luck with your sewer problem. Hope it all turns out well. Love Tony Chachere’s Creole seasoning. We use it on practically everything! Yay for non-organ meat rice! My husband asked me to buy him chicken livers for catfish fishing bait, and I refused. I would not even put that nasty stuff into my cart, let alone anywhere near my mouth! Can you make this with brown rice? I’ve ne ver cooked anything Cajun and while I usually cook with white rice I was just curious if brown rice would work as well? I lived in NOLA for 3+ years and had NO idea that dirty rice contained organs. And I definitely ate and enjoyed it repeatedly while I lived there. I am kind of speechlessly grossed out by this revelation, and also excited to try this not grody version. Also, as a current victim of a pregnancy cold and as someone who lived through their sewer line cracking and leaking in NOLA (please let’s not discuss the droves of cockroaches that infiltrated our house before we found out the pipe was cracked), just know that you have my most sincere condolences. You gave me a HUGE laugh – I can’t make my dirty rice with those funky pieces/parts either. ICK – the man loves rumaki but in this house, we have to make 2 kinds and mine don’t involve chicken livers. I’m so glad this showed up in my blogroll – I made the rolls last night for tomorrow’s Roast Beef Po’Boys. Your dirty rice will be a perfect side. I decided I couldn’t wait for Mardi Gras to try this so I made it today. It was DELICIOUS! All my kids loved it, which is a huge bonus. And my husband loved it and my brother-in-law took at least 3 helpings. With 2 cups of rice I thought for sure we would have leftovers (I was serving it as a side to a pork roast) but there’s just a tiny bit of rice left — with all the sausage picked out. 🙂 Not-so-dirty dirty rice is a definitely a keeper! You poor girl-feel better soon! And I never knew dirty rice had organ meats in it; that’s gross! Thank you for the non-gross version. And the best feel better fix is always chocolate! So, I am an animal scientist (beef cattle) turned stay-at-home mom. I love your blog. Just to put your mind at ease, I have toured several meat plants and sausage/hot dog making areas. They don’t put organ meats into the sausage or hot dogs or hamburger (at least not in the plants I’ve been to). They use normal meat that is not quite the right size or shape to sell as a different cut. Thanks for the great recipes! THANK YOU! I’ve been looking for a good recipe that DOESN’T use organs!!! So this is Dirty Rice for clean people?! My grandpa (a dairy farmer) always said organ meats were for dogs. 🙂 This one is going into the quick-and-economical-meal queue! Made this last night. It was a huge hit. Kids didn’t even realize that it was full of onions and green peppers! I will definitely be making this again! Thanks! This recipe was so good. Very flavorful. My husband loved it. I made it spicy…..Yummy!! Stuff it inside a whole chicken you are going to roast. The chicken juices make it even more delicious. Hilarious post, except the part about the sewage. That is so sad and horrible. Thanks for the recipe. I will make it right now.